There was a lot of fascination with foods from far away places a hundred year ago. It may seem presumptuous today, but back then people believed that the world was getting smaller, and there was interest in how people served foods in other countries. Tea houses were very popular in the United States in the early 1900’s, and it was widely believed that the Japanese knew how to serve tea and other foods very elegantly and gracefully. A Japanese table, exquisitely dainty and unpretentious, is that decorated with day lilies. It is laid with a snowy crash runner, and has crash plate doilies. The shallow white center flower bowl contains four claw feet holders, and from these, tall spikes of the white lilies rear their fragile heads above their own bloom. Note the arrangement at the base, and observe how the lily leaves are clustered to form pads, thus accentuating the green and white effect against the snowy background. Blue and white Canton dishes add the final note of color to this dainty luncheon table. Crash: A coarse, light, unevenly woven fabric of cotton or linen, used for towels and curtains. Posted on May 25, 2017 May 25, 2017 by SherylPosted in OtherTagged tablescape. Nice, I’ll bet that looked beautiful in person with all the green and white! Really interesting. I have never heard of the type of fabric either. I have a bunch of Rain Lilies blooming right now that would be perfect for that table. Somehow crash doesn’t quite work for me as a fabric name. It sounds like something that is a mess, rather than a lovely cloth. Maybe that’s why it isn’t popular anymore. What are rain lilies? I’m familiar with regular lilies and day lilies, but not rain lilies. Maybe they don’t grow around here. Here’s one of our native species from my new photo blog. We have a couple of white species, and at least one yellow one. They got their name because of their habit of popping up a few days after a rain. Up in your area, the garden shops sell non-native rain lilies called zephyr lilies, but note that they need protection in the winter, since their native habitat is much farther south — like Central America. We have them at Mom and Dad’s in northwest Texas. They especially loved to bloom right after a rain shower, and the last time I saw them popping up was in September. They are very tall with a fairly thick stalk, and will stay erect readily–or at least the ones we had did. They are in the Amaryllis family. They only bloom 2 or 3 days after a rain. And no they probably will not grow up north, as the lilies are evergreen here. They are our substitute for tulips or crocus. If you do a search on my blog you can find some posts on them. 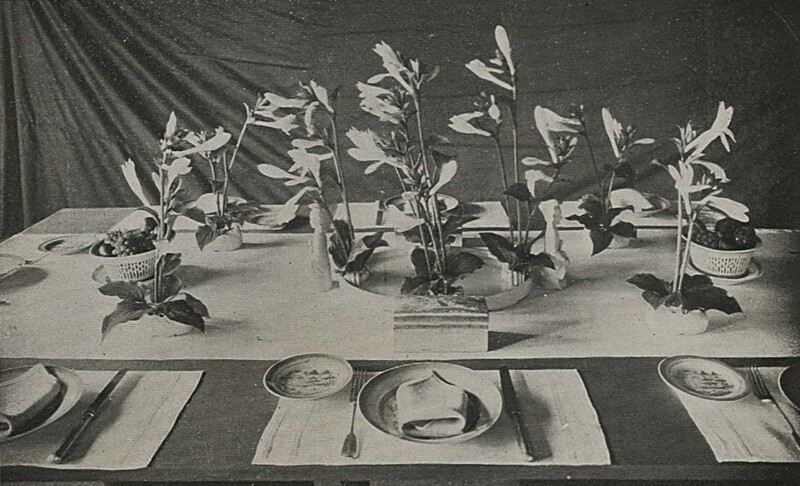 A beautiful tablescape that would still work today. I agree! I really like the fresh flowers on the table. Thanks for this, and all your postings. I’m sorry I’m not good at responding lately. If it’s not one computer emergency it’s another, it seems. But I have to confess I just returned from a delightful week in Brasstown, N Carolina, at the John C. Campbell Folk School. Had fun with oil painting, never having lifted a brush for oil before. I think I may even hang one of the little ones, but it’s a good thing I’m not thinking of developing an art career. No need to apologize – I always appreciate comments, but definitely don’t expect them. Your trip sounds like so much fun. I’ve never tried painting with oil, but would like to try it someday. Thanks for the crash course in Japanese tablescaping. The photo is rather exotic. I really like the tablscape, but it is definitely different from the typical modern tablescape. I don’t think that so many different vases would be used today. The flowers look like they are dancing. I’m glad you looked up the “crash” , new one for me too. I wonder how they kept the flowers upright in the vases. The stems are so long relative to the vases, and they look like they might be top-heavy. After taking a closer look .. I wonder if they are flower .. it almost looks like a tree stem with leaves cut off to give it this appearance. Then maybe they used a nail base . I enjoy the wonderment of the decor of a foreign land making special setting that sounds absolutely lovely. I feel like that today, modern technology has almost accomplished that. Isn’t it interesting that this was before WWII? I presume there was a period of time when Japanese tablescapes wouldn’t have been so popular. But today? The Japanese concept of wabi-sabi is everywhere — at least, it’s in many of the decorating magazines. As for “crash,” the online etymology dictionary says it’s rooted in a word that means “to break into pieces.” It sounds as though different sizes, lengths, and types of yarn could be used in making crash fabric, so maybe that’s the source of the name: the fabric’s made from pieces. Fascinating! I had never heard of “crash” fabric before either. The thought of a tea ceremony is so elegant. So glad I found your blog. This sounds very interesting! And I am sure the table was gorgeous in color.